HMAS Anzac has been welcomed home following a six-month deployment to the Middle East. Family and friends filled the wharf at Garden Island in Sydney on 26 January, waving Australian flags as they cheered the 191 members embarked on the frigate. Anzac’s deployment as part of Operation SLIPPER and the multinational Combined Maritime Forces (CMF) included a critical role in disrupting support to terrorist and extremist organisations in the Middle East. “Everyone onboard Anzac has been a part of a tight-knit team during this deployment, working in arduous and tough conditions to secure the maritime environment for legitimate trade,” Commander Stavridis said. Prior to their return to Australia, Commander of Joint Task Force 633, Major General Michael Crane, said Anzac should be proud of its mission. “Anzac has had a highly successful tour and contributed to the full scope of Combined Maritime Forces operations including maritime security, counter piracy and regional engagement,” Major General Crane said. The return marked the conclusion of Anzacs third deployment to the Middle East and was the 29th rotation of a Royal Australian Navy ship since September 2001. 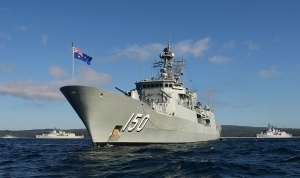 Anzac was relieved on station by HMAS Toowoomba earlier this month.